Why does Light Yagami shuffle the two death notes? Light Yagami gives a death note to Rem and asks Rem to give it to Ryuk. Then Ryuk drops the book according to Light's order. Light then takes back Misa's book while doing something similar with his own book. If I recall correctly it was a part of Light's grand scheme to fully exonerate him as being Kira in the eyes of the task force and to kill L.
Only Light's Death Note had the rules written in English (see comments) and he added the fake rules in the back about needing to write a name very 13 days and if you destroy the Death note all those who touched it will die. The Fake Death Note Rules are two rules that Light Yagami persuades the Shinigami Ryuk to write into the Death Note as part of a plan to clear him of suspicion. These rules ultimately lead to his downfall. If the user of the Death Note fails to consecutively write names within 13 days of each other, then the user will die. If a person makes this notebook unusable by tearing it up or burning it, all the humans who have touched the Death Note will die. Ownership of this Death Note had to go to one of the Shinigami to then go to one of the Yotsuba Group (or any big company) and trusting L's detective work he would find the new Kira and recover the Death Note. To do this Light had to have a second Death Note on him as he gives up ownership of his in order to retain his memories and claim ownership of the new Death Note when it's ownership is given up by one of the Shinigami. his new one he can give up ownership when he wanted to "get rid of this pride" while in imprisoned (ie. get rid of ownership and erasing his memories). Now it was important for Rem to be the Shinigami of this Death Note that L recovered because if Rem didn't play along Misa's life would be in danger as such the fake rules wouldn't be exposed. Of course Light knew L well enough that L would still pursue Misa and seeking her execution by proving she was the Second Kira, forcing Rem's hand to then kill L. L would then be killed by the Shinigami everyone knew about and not by Kira and it would also kill Rem having intervened in Misa's death. This actually changed the Shinigami attached to the notebook. Rem left with Light's original notebook. And Light buried Misa's notebook that Ryuk became attached to. Why he needed Rem to be attached to his notebook really wasn't clear. 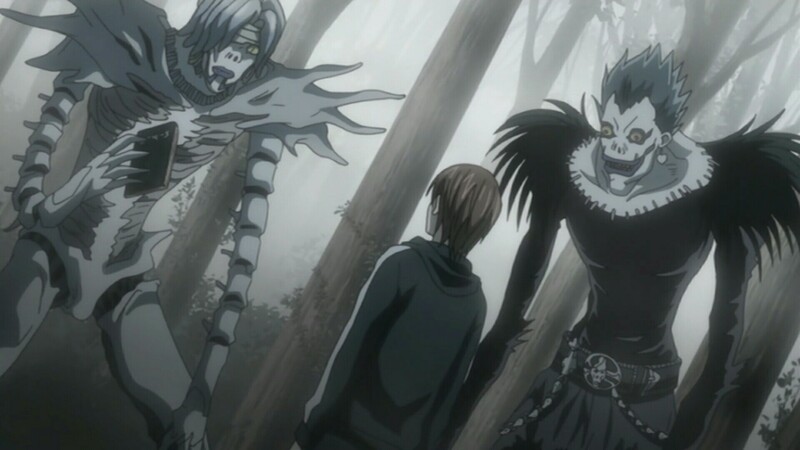 Ryuk would have never given up the fake rules, and since Misa went and got her notebook back as well she had Ryuk following her. The only thing that really made the difference I think, is that when Rem wrote down L's name in her death note, everyone saw that Rem was dead. (Maybe that was the point.) Light needed his notebook to be the one that was recovered so he could write someone's name quickly and get his memories restored fully. Light Yagami shuffles the death notes between himself, Rem, and Ryuk so that when he and Misa regain their death notes and their memories they will have swapped shinigami, leaving himself with Rem and Misa with Ryuk, so he can have Rem with him in the investigation room so Rem will discover that Misa is in danger and kill L, dying in the process. Rem plays right into his hands, even surpassing Light's expectations and killing not only L, but also Watari before crumbling to a pile of dust. Light then takes over the positions of L and Watari (as planned) and gains control over the investigation squad. He then has his father hide the death note that was used to kill L, knowing he won't need it because he has the other death note, and he and Misa move in together. What did Light write before killing Shibuimaru Takuo? Is Misa's suicide being caused by Light's death a flaw in the story? Can you extend your own life with the death note? Why did Rem die in The Last Name? Could you avoid to die due to the death note if you have no heart in your body? How did Mello know how to help Near in Death Note? Were there more than two Death Notes? Is Ryuk required to write Misa's name in his Death Note at the end of her life? Are there any reasons why Light killed the FBI agent? Why was Light only targeting Japanese criminals when he was in the US?